In testimony before the House Judiciary Committee last February, Melba Acosta-Febo, President of the Government Development Bank for Puerto Rico (GDB), explained that that combined debt for the Puerto Rico Electric Power Authority (PREPA), the Puerto Rico Aqueduct and Sewer Authority (PRASA) and the Puerto Rico Highways and Transportation Authority (PRHTA) exceeds $20 billion. These are only four of the 18 government agencies that contribute to Puerto Rico’s debt. Currently, Puerto Rico’s debt is being debated on the floors of Congress and in front of the Supreme Court and the outcomes of these debates will have a significant impact on american tax payers, shareholders and existing US law. 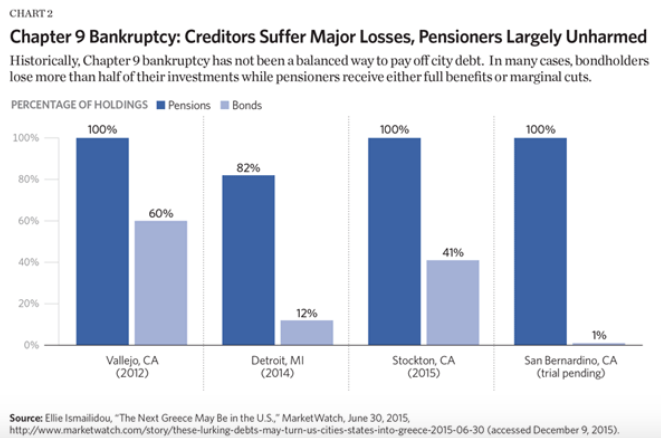 If you take a look at the US mainland, similar spending and debt problems exist in many progressive counties and states, resulting in many municipalities to file for Chapter 9 bankruptcy protection. This protection allows for these entities to restructure their debt to pay off their creditors. Yet, the investors (bond holders) are the ones who receive very little, while the debtors (pensioners) remain fully funded. Since 1984, the territory of Puerto Rico is not allowed to enact Chapter 9. In 2014, and in response to their looming debt crisis, the island’s government enacted their own bankruptcy law designed for it’s big public utilities, but that attempt ran afoul of US Federal Law which states that only congress can enact bankruptcy laws. Additionally, Franklin Advisers and OppenheimerFunds, filed suit on the same day the law was enacted. They argued that “no matter how much Puerto Rico might want to take shelter from creditors, the bankruptcy code clearly said it could not file for Chapter 9 protection, nor could it enact its own bankruptcy law. The United States District Court in San Juan and the Court of Appeals for the First Circuit agreed.” The Supreme Court of the United States is hearing this appeal, and Justice Sotomayor, of Puerto Rican descent, reinterpreted the federal code and helped Puerto Rico argue their case. Puerto Rican citizens do not pay federal income tax, but do contribute and and receive SS and Medicare benefits. According to the Heritage Foundation, approximately 60 percent of their residents rely on government healthcare and a household of three receives 50 percent more of its’ income from welfare than from work. Median household income is $19,000. 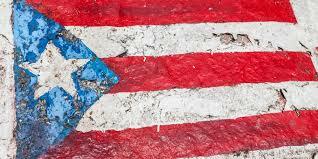 About 45% of Puerto Ricans live in poverty, versus a national average of 16%, according to the Treasury Department. The Jones Act increases shipping costs on the territory’s businesses and consumers. Small businesses complain that they are subject to US federal minimum wage laws that make it difficult for them to do business. Moreover, these hikes in the minimum wage were sharply disruptive, according to a 1992 National Bureau of Economic Research analysis. They resulted in “substantially reduced employment on the island” and mass migration of suddenly unemployable lower-skilled workers to the U.S. mainland.” Fight for 15 anyone? 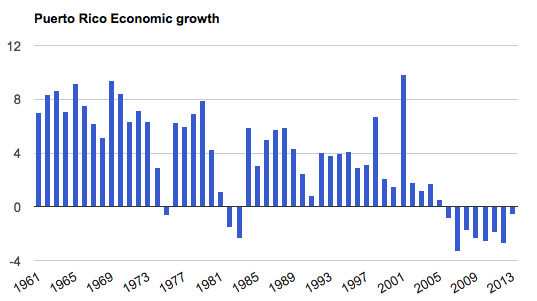 As Peter Ferrara explains, “The root of the problem is Puerto Rico’s economy, which no longer reflects the island’s name. Only 40 percent of the adult population (3.2 million) is even in the workforce, with about a third working for the government. With 12.5% unemployment, the Island’s population is declining, down 5% in the last 5 years. Those leaving are the most productive professionals, taking their incomes and tax payments with them.” Approximately 1,500 islanders leave for the mainland or other parts of the Caribbean each week. Puerto Rico’s Governor, Alejandro Garcia Padilla, refuses to acknowledge that government spending, along with a raise in the minimum wage, has contributed to his billion dollar problems. He is demanding that the bondholders takes pennies on the $14 billion dollar bonds in return and that the US extend Chapter 9 laws to his territory. They say the road to hell is paved with good intentions, and the humanitarian crisis, to which Gov Padilla speaks, is very typical of a progressive liberal who continues to spend other people’s money, on behalf of the common good–without concern for a limited money supply, economic fluctuations, or debt obligations; thereby, creating a humanitarian crisis of dependency on government.